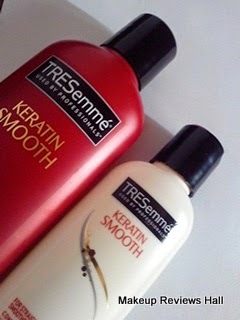 Tresemme Shampoo & Conditioner Review - Keratin Smooth for Straighter & Smoother Hair. 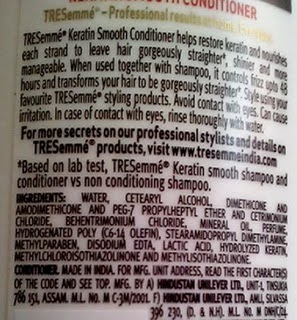 Tresemme Keratin Smooth Shampoo with Low Sulphate Formula. Don’t let unruly frizz get the better of you. Use the Keratin Smooth collection to get smooth, more manageable hair for up to 48 hours*. So get ready to say so-long to frizz with the latest salon innovation! Keratin Smooth Crème Serum Keratin Smooth Crème Serum. Want hair that’s smooth, straight and easy to style? Use the shampoo specifically formulated to leave your hair gorgeously sleek and manageable. The TRESemmé Keratin Smooth Shampoo and Conditioner system transforms your hair, making it gorgeously sleek with less frizz*, smooth and easy to style. THE EFFECT: The TRESemmé Keratin Smooth Shampoo and Conditioner system transforms your hair, making it gorgeously sleek with less frizz*, smooth and easy to style. For protection from heat styling tools use Keratin Smooth Flat Iron Smoothing Spray before you style. PRICE - Rs 180 for 215 ml. This Tresemme Shampoo comes in a nice sturdy red colored plastic bottle with a flip cap which is quite easy to open and close as well. This bottle is slightly big in size so I might not carry this with me while traveling. However I even saw the one in smaller size which I think would a perfect company in travel. The texture of this shampoo is very smooth like it's name and it lathers very wll leaving a nice soothing fragrance which liners for quite long. 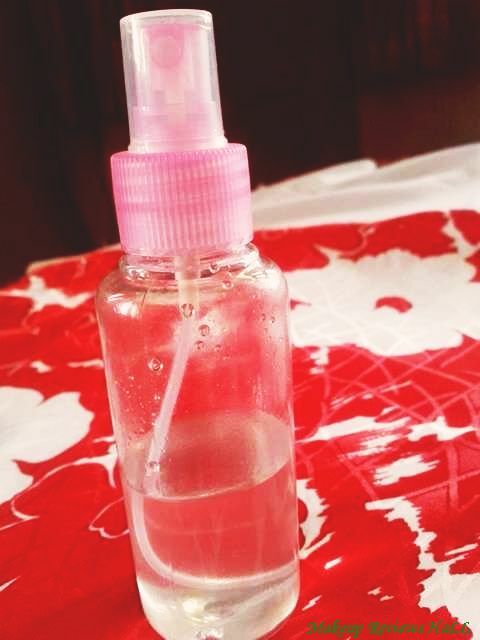 Now a days most of the cosmetic products are loaded with SLS, specially shampoos and I have always try to use sulfate free cleansers since sls causes lot of damage to hair making them even more rough in long term. It's only when I suffer from DANDRUFF or some other hair problem, I switch to strong medicated shampoo like NIZORAL for some while. When I got to know I m getting a sulfate free shampoo, I didn't want to miss this since this could be a perfect solution to my dry frizzy hair with less or no damage due to less sulfate. The shampoo is just of perfect consistency neither runny nor thick and lathers very well with just little amount. The fragrance of this is quite strong but I do not find it a problem since I like the fragrance and did not even mind it lingering on my hair for more than a day. 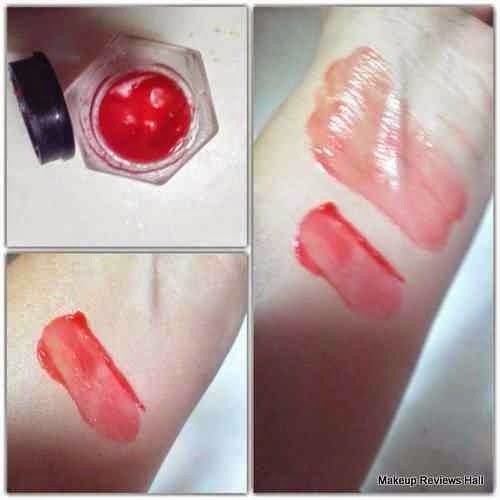 Rather it was not too strong after rinse and made me feel fresh on smelling. On application the shampoo lathers well giving me a squeaky clean hair removing all dirt and oil. I used this during winters so there was not much of oil accumulation so I used this only one and it gave me nice lively bouncy hair. I was happy with the use of this shampoo since it turned my limp thin flat hair into smooth voluminous with some bounce. My hair are normally frizzy dry and difficult to tangle even with the use of leave in hair serums. This time too I needed a hair serum to detangle hair which I only used in the end so that they don't appear flat from top. I was quite happy with the results of this shampoo seeing my nice lively bouncy manageable hair along with the soft fragrance in them. 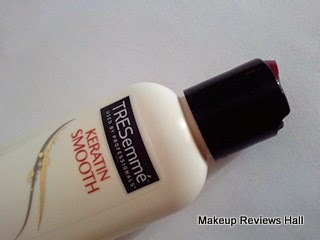 This was all about the Tresemme Shampoo, now let's take a look at this Tresemme Keratin Smooth Conditioner. This shampoo works great with dry hair types but definitely not a shampoo for oily hair. When used with TRESemmé Keratin Infusing Shampoo, this salon-quality conditioner nourishes each strand to leave hair smooth, shiny and manageable. The system transforms your hair, making your hair gorgeously sleek with less frizz*, smooth and easy to style. 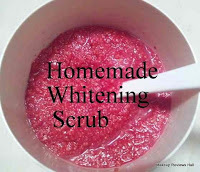 Leave in for 2–3 minutes, then rinse thoroughly. For frizz protection use Keratin Infusing Smoothing Serum before you style. PRICE - Rs 80/- for 90 ml. This Tresemme Conditioner comes in a similar packaging as that of the shampoo but has completely different color. The shampoo is in red bottle whereas the conditioner is in absolute white colored bottle. 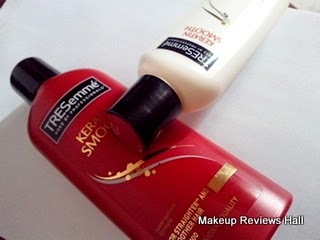 On a first look I thought these bottles are from different variants of Tresemme since I have always seen same color and design bottles of same variant. But this was something unique and likeable since it clearly diffentiates the two bottle. Otherwise normally we need to read the name while taking shower. Once I used the conditioner instead of shampoo while in a hurry which later made me realize my foolishness when I saw my hair oily sticky instead of the bounce as expected after the first day hair cleansing. The fragrance of this conditioner is fruity and similar to the shampoo, nice but little on the stronger side. But I don't like conditioners with strong fragrance since I sometimes leave them on the ends without rinse for easy detangling which makes the smell even more stronger. I bought this conditioner in a small bottle which is quite travel friendly and comes with a flip easy to open and close. The texture of this conditioner is quite thick and creamy. I use very little of this and spread it all over my hair leaving the top and focusing on the ends. Now my hair type is somewhat thin and dry and this condioner make my thin appear even more thin and limp. Though it gives nice shine and smoothness to my dry rough hair making them more manageable but at the same time they appear thin and flat. So I avoid using this whenever I need to go in any party or function. I use it on official days when I want my hair neat, shiny and tidy in a professional ponytail look. In that case also I use it in very little quantity. 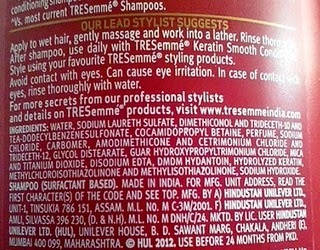 So this was all about this TRESEMME SHAMPOO & CONDITIONER. I like the shampoo very much since it turns my dry rough hair into lively smooth hair with added shine but I don't like the condioner much since it makes my thin appear even more thin. 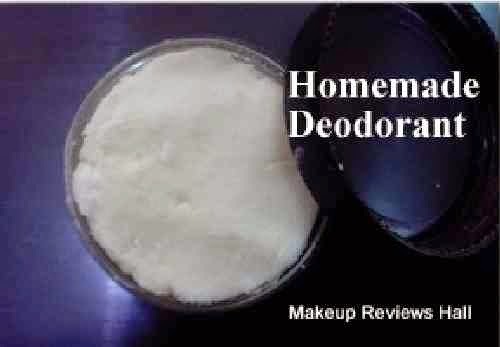 I love using this hair cleanser with my own homemade conditioner for dry hair, the combination of these makes my hair silky smooth and manageable without any heavy greasy feel, taking care of the the very little amount of conditioner to be used. 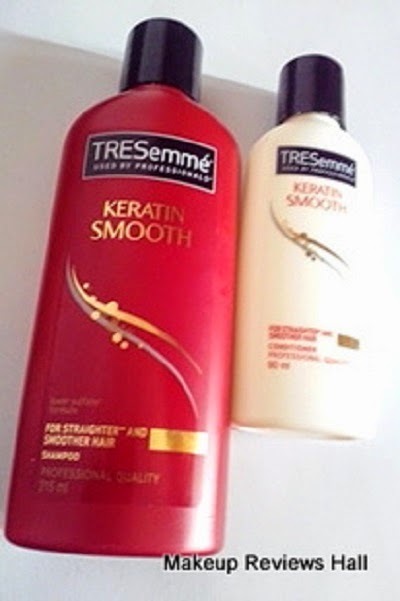 If one has dry rough but heavy hair type than this combination of TRESEMME KERATIN SMOOTH SHAMPOO & CONDITIONER, would be best for you but if you have thin dry hair then you can definitely try the shampoo but stay away from the conditioner. Comes in nice bottle packaging with a flip top. Available in different sizes to choose from. Works as a special treat for dry rough tangled hair types. Adds shine to hair making them soft and smooth. 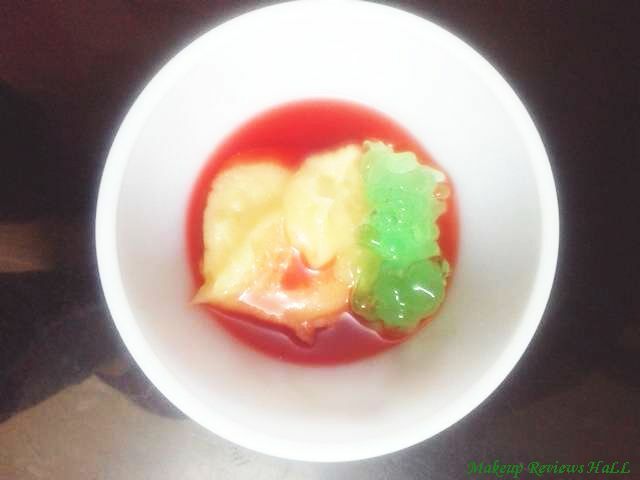 Comes with a nice fruity fragrance. 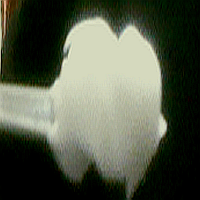 Low sulfate formula for less damage to hair. Easily available both online and offline. Perfect combination of hair care products for dull dry heavy hair types. Gives smooth straight hair as claimed. 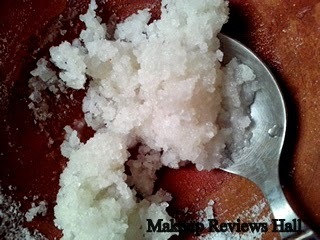 Conditioner little thick and weigh down hair if used more. Thin hair appears more this with the use of this Keratin Smooth Conditioner. Strong fragrance for those with sensitive nose. Hair becomes flat on the second day with the use of extra Conditioner. i have used it. 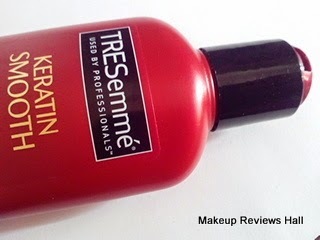 i like tresemme keratin shampoo than conditioner. Hey there. I've been using tresseme for about 3 months. I wondered if you also get hair in your hands when you comb your hair using your hand while shampooing it (but not in the conditioner just the shampoo).